Born in St. Elizabeth, Jamaica in 1945, photographer Armet Francis moved to London at the age of ten. By his mid-teens Francis was working as an assistant for a West End photographic studio. His early photographs show him experimenting with the camera as a technical device and a tool for self-representation. The camera is a Yashica-Mat LM, an all-mechanical model introduced in 1958, which has an inbuilt light meter. As Francis sets up his shot in front of a mirror, he consciously records himself as a photographer whilst offering an intimate glimpse into his world. The scene challenges ideas of a racially divided society commonly associated with this era. 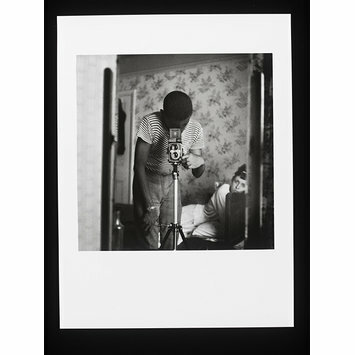 The V&A acquired nine photographs by Armet Francis as part of the Staying Power project. Photographs by his contemporaries Neil Kenlock and Charlie Phillips were also acquired as part of the project. Staying Power is a five year partnership between the V&A and Black Cultural Archives. The project aims to explore black British experience from the 1950s to the 1990s through photographs acquired by the V&A and oral histories conducted by Black Cultural Archives. 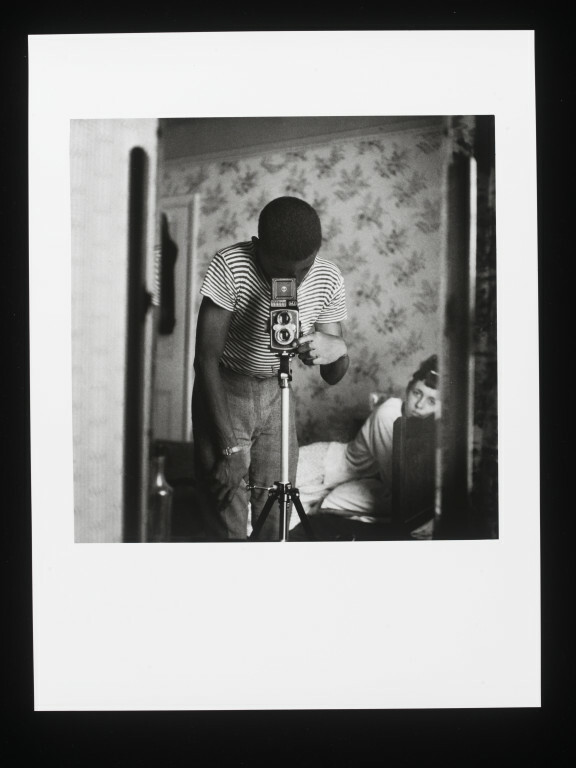 A black and white photograph of a mirror reflecting a young black man wearing a striped t-shirt looking into the view finder of camera mounted on a tripod. In the background is a young white woman lying on a bed. The room is decorated with floral wallpaper. intimate glimpse into Francis’s personal life. then establishing himself as a professional photographer.